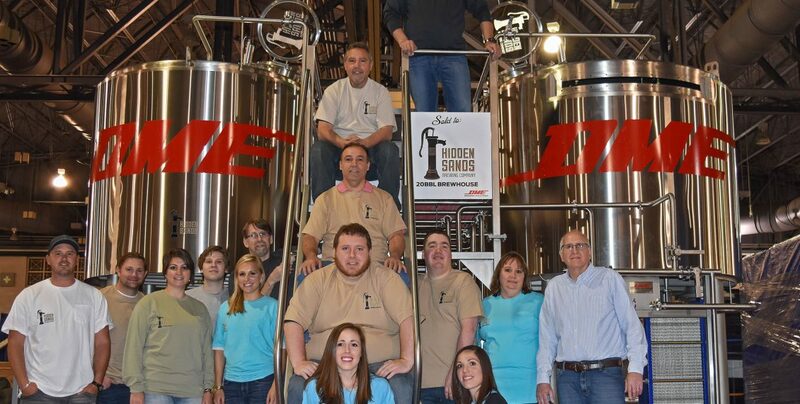 When Hidden Sands was still just an idea, we recognized that having state-of-the-art brewing equipment was paramount to our goal of delivering the highest quality product to our customers. To that end we performed extensive research to determine which manufacturer was the right fit for us. Early in the process we narrowed the search for our equipment partner to five companies. Throughout this process, we met many wonderful people in the industry, and in doing so gained a deeper understanding about each company. We were surprised to learn that all brewing equipment is not created to work the same way; the methods in which different companies manufacture their equipment is closely related to how they understand the brewing process. After the annual Craft Brewer’s Convention, partner Matt Helm would attend the National Restaurant Show every year. On the last day this particular year, he stopped by one final exhibit to check out a system he hadn’t seen before. After a brief discussion, it turned out that the manufacturer of this system built brewing equipment as well. The focus of the conversation turned to our project, and it seemed that they were as well qualified as the other manufacturers we previously investigated. Shortly thereafter, an hour-plus phone conversation with Marc, the manufacturer’s Director of Sales, kicked off our relationship with Diversified Metal Engineering (also known as DME Brewing Solutions), from Charlottetown, Prince Edward Island, Canada. We felt strongly that DME had leap-frogged the other companies we were considering, but just to be sure, we took a journey through New Hampshire, Massachusetts, Maine and Vermont visiting breweries that used DME-manufactured systems (Best. Business trip. Ever.). At every stop we came across pleased DME customers. About a month later we planned a trip to Halifax, Nova Scotia to meet with DME and tour a few Canadian breweries that were local to their manufacturing facility. The next day found us in Charlottetown spending time in the DME facility and visiting a few more breweries (noticing a pattern here?). We spent the morning meeting the DME office staff, touring the manufacturing floor and looking at their vast storage of completed equipment. Our final introduction was to a Project Manager named Rick, who we hit it off with immediately, and who ultimately became key to our making a final decision. By the close of the 2015 Craft Brewer’s Conference we were convinced; we shook hands on the deal and were ready to move forward with DME. One of the points we negotiated in the deal was to have our brewhouse completed and delivered to the 2016 Craft Brewer’s Conference in Philadelphia. The CBC moves around every year, and we wanted to take advantage of the opportunity to time our public announcement with a display of our shiny new equipment in our own backyard. Not only did DME deliver on time, but they included many features that we didn’t necessarily order, a surprise we will always be grateful for (and benefit from!). In anticipation of receiving our brewhouse, the Hidden Sands crew turned out in force for the 2016 Conference at the Pennsylvania Convention Center. It was easy to spot the trailers that contained our goodies, as they were the only ones with Canadian plates. We helped unload and assemble our equipment on the Convention Center floor, a process that was both exciting and relatively simple (which bodes well for when we have to do it again in EHT). By the time our announcement was released to the media, we were showing off our shiny “new toy” to the crowds at CBC, thanks to Rick and all the great folks at DME. Read more on what makes our equipment so special!